"Consider responsibility, accountability and civility in online environments". My evidence of learning for the course outcome of repsonsibility, accountability and civility in online environments is my academic paper titled " Teachers and Social Media in the BC Context: Exploring the Boundaries". This paper was thoroughly researched and addresses aspects of social media use that include digital professionalism, privacy, social justice and safety. I am now knowledgable in privacy and safety when it comes to the use of social media tools. My confidence, interest and passion for teaching digital citzenship and the safe use of social media to enhance teaching led me to present at my school's Pro D session. For online learning and teaching it is imperative that teachers and students are informed of the benefits and risks associated with use. social media and web 2.0 tool use. At this Pro D Presentation, I explained the implications of FIPPA and the responsibilities of teachers to ensure they are in compliance with the privacy and protections act. I made available sample permissons and backgrounders I created for using Pinterest in the classroom so teachers could model them with their own social media use. Many teachers thanked me for the presentation and informed me that they were not aware of any of the privacy and safety procedures for social media use in the classroom. I had one teacher volunteer to work with me to create a risk management plan for our school. "Scaffold Digital citizenship from K-12 to professional level of educators"
The evidence for scaffolding digital citizenship from K-12 to professional level of educators is a presentation given at the DL Conference 2014 in Vancouver. 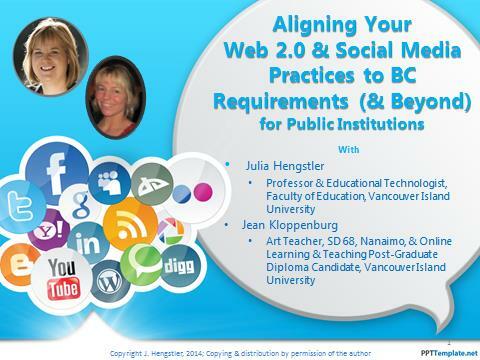 I co-presented with Julia Hnegstler on "Aligning Your Web 2.0 & Social Media Practice to BC Requirements(and Beyond)". This experience embedded my knowledge gained in OLTD 506 and increased my confidence level for presenting to colleagues on practical uses for social media with online or traditional classrooms. I provided exemplars of my permissons and backgrounders for Pinterest and lesson ideas for art and photography courses. The second portion of the presentation was a hands on workshop collobrating with colleagues to create their own templates for web 2.0 use. After this conference, I was fully prepared to present a Social Media and Web 2.0 workshop at my school Pro D. Staff now come to me for clarification on social media permissons and safety. I am looling forward to continue the push for a risk management plan with the use of social media by creating a "response to incident" poster to be posted at the school.